Fact: Youtube is one of the largest used platforms on the internet. Omnicore reported 30+ million daily active Youtube users. That’s insane (and the number 1 reason you need to be on Youtube). Let’s go over how to create a Youtube channel so you can reach your active audience and grow your real estate investing business. We’ve gone over other social media platform strategies in the past. Our guides have helped your real estate investing business build a successful Instagram and advertise on FaceBook. 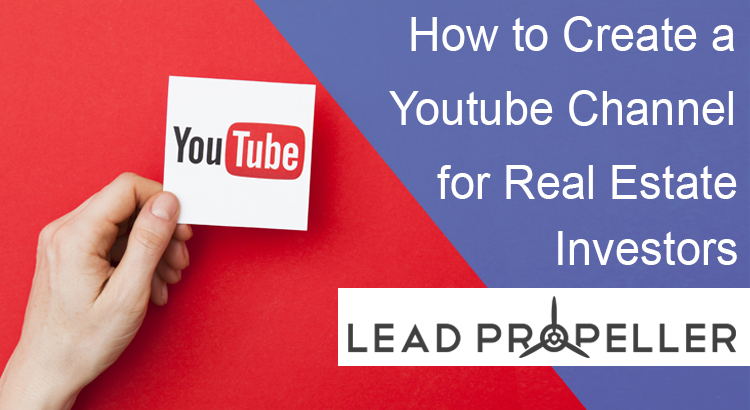 Now let’s tackle how to create a Youtube channel that gets you leads and builds your brand. Setting up your Youtube channel is easy. In fact, Youtube has a great Creators Academy that helps new channels understand the platform and everything that comes with having a successful channel. We definitely recommend you check it out. This article will be a quick run down of how to create a Youtube channel, but if there’s anything that you still have questions about the Creator Academy will answer them! Ok, onto the real stuff. Since Youtube is a Google property, your Google account and information will be imported over unless you specifically tell it not to. This is pretty good for SEO because your channel will automatically be linked with your Google + account! So the first step, just like with any social media, is to sign in and create your account. Similarly to your Instagram handle, your Youtube channel name should be your real estate investing business’s name or something similar. If your channel name is too different from your actual business it’s going to be difficult for people to find you and it’s going to look like your channel isn’t associated with your business. When you’re working on how to create a Youtube channel for your real estate investing business you want to make sure you’re optimizing it for business and branding purposes. If you’re not optimizing your channel, you might as well not have it. Bummer…we know. Our partner channel, FlippingJunkie, is categorized as “People and Blogs” because Danny and Melissa have a variety of video content types. 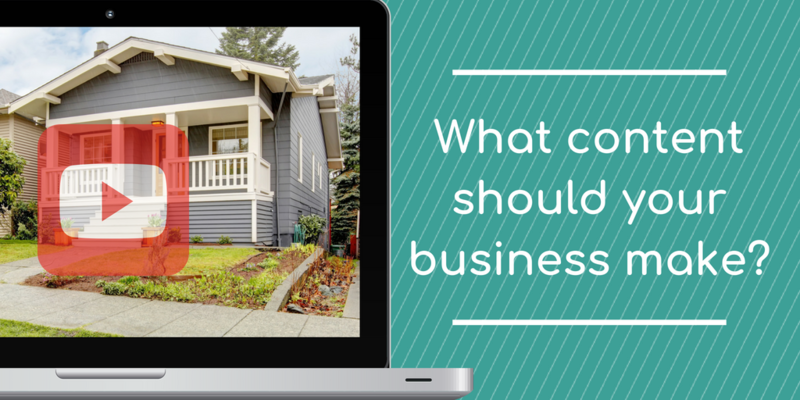 For your real estate investing business, we suggest either going with “People and Blogs”, “Education”, or “How to and Style”. Of course this will depend on your brand and video type. If you’re doing a lot of videos explaining the wholesale process, “Education” is probably the best fit for you. If you’re making videos on how to flip houses and before and after videos of your properties, then “How to and Style” might work better. Once you have your category figured out you have to make your channel public. If you don’t select the public box then your videos will never show up in searches or the “related videos” side bar. This seems obvious, but you’d be surprised with how many people accidentally leave their channels as “private” or “unlisted”. Don’t make these rookie mistakes! Youtube works off of SEO, especially because it’s a Google property. 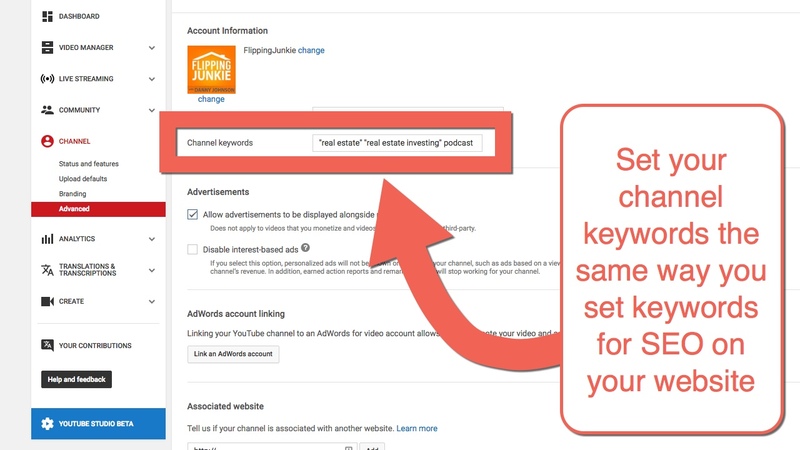 Which means you need to know which keywords to use for your channel. Unlike AdWords or traditional SEO, Youtube isn’t as specific with their keywords and tags as Google or Yoast is. Meaning you can be more generalized. Instead of making your channel keyword something like “San Diego house flipper” or “real estate wholesaling”, go with something more simple such as “house flipping” or “real estate investing.” The point with Youtube is to get views. You won’t get views if your channel and content are so highly specific that they never make it to searches. You don’t want more than 2 or 3 keywords at the most. Knowing hot to create a Youtube channel that gets lots of views is all about not over doing it. Remember, if you’re too specific then no one will be able to find you. What Content Should You Be Making? How to create a Youtube channel that actually grows your brand is all about the type of content you’re making. The most important rule is to make content, not commercials. I’ll say it again for the people in the back: Make CONTENT not commercials! It’s going to be tempting to make videos that just promote your business and services. DON’T DO IT. People don’t go on Youtube to watch commercials. That’s why Youtube Red is so popular! People like the ad blockers. So why would it make sense for your channel to be nothing but commercials for your business? It doesn’t, so don’t do it. Focus on making quality content that your audiences will enjoy. Content that they can connect with is what grows your brand and makes people feel like they know you and your business on a personal lever. Remember what we’ve said in the past, social media marketing is all about authenticity and humanizing your business. If you want to make commercials, that’s great! We encourage that. But use them as commercials, not as content. Your commercials should be running in your Facebook advertisements and as part of your AdWords campaign. If you have any questions about how to use videos in your AdWords or Facebook ads, follow those links. They have a lot of great professional information to help you build your online marketing strategies. But since you’re here to learn how to create a Youtube channel to grow your brand, let’s keep talking about the type of content you need to be making. You might be curious about why testimonials is on the “do not post” list, especially after all the positive things we’ve said about using video testimonials in the past. Video testimonials are great, and you should be making them, but these aren’t what people are going to come to your Youtube channel to watch. Testimonials are commercials. They’re perfect for ads, not for organic content. 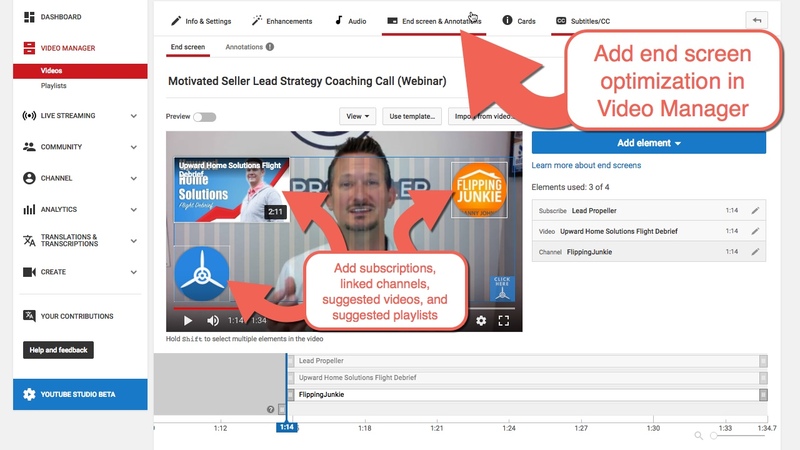 Use video testimonials in your Facebook and AdWords campaigns and on your website, but do not post them on your Youtube channel as content. If you don’t believe us try posting a few and look at the analytics for those videos after a few months. You’ll find that people will rarely go directly to them, if at all, and they will definitely have the lowest view count of all your other videos. At the end of every Youtube video you’ll see picture-in-picture thumbnails for other videos and a channel picture to subscribe. You need to have these as well. These appear at the end screen during the video sign-off. You don’t need a long sign-off, but you do need one. Once you have a solid sign-off and have uploaded your finished video into Youtube, go to your “Video Manager”. Click “edit” on your most recent video and select the “End screen & Annotations” tab at the top of the editor. Select the side drop down that reads “Add Element” and select the ones you want. We suggest making your end screen annotations take up the entire time Youtube gives you. Make sure you select the “Subscribe” icon as one of the elements. You can resize it and put it wherever you want! Do this to make it easier for viewers to subscribe to your channel. Typically “link” won’t be enabled. We also don’t suggest doing “channel” because it’s meant to promote a channel that isn’t yours. Don’t do it unless you’re making a collaboration video with another investor. We suggest “video or playlist”. Choose one of your other videos and a playlist you have and add those to the end screen. This will help viewers move through your content better! You can’t just rely on your channel’s keywords. When you upload a video there’s a section underneath the description where you enter video tags. These work just like keywords. You can be more specific with these, but you do not want to be too specific, too general, or have too many. These video tags are to help Youtube categorize your video better so that it can be matched with other content that users want to see. So if you’re making a house flipping before and after video, you want it to show up on the “related videos” side bar for someone who enjoys that content. The ideal number of tags should be around 4 – 7 per video. You do not want more than that. Once you start doing more than 7 Youtube gets confused with what your video is actually about. Rather than try to figure it out, Youtube thinks it’s spam and just won’t list it very high. 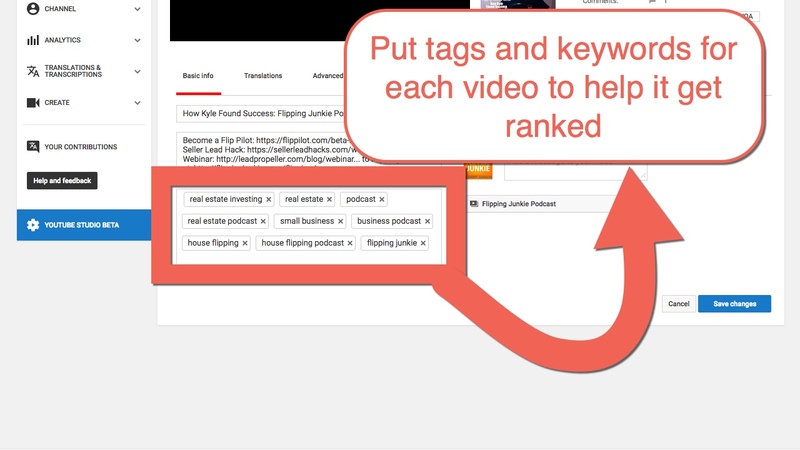 This is a great way to see what keywords are ranking for the type of content you want your channel to make. It’s important that you look at the keywords for the top ranking videos that your competitor channels are producing, that way you’re using top ranking keywords too. Do this for each of your videos and you’re sure to start showing up on page 1 and the “related videos” side bar! The last step in how to create a Youtube channel for your real estate investing business is making playlists for your videos. Once you have at least 5 videos on your channel you’ll want to start organizing them. 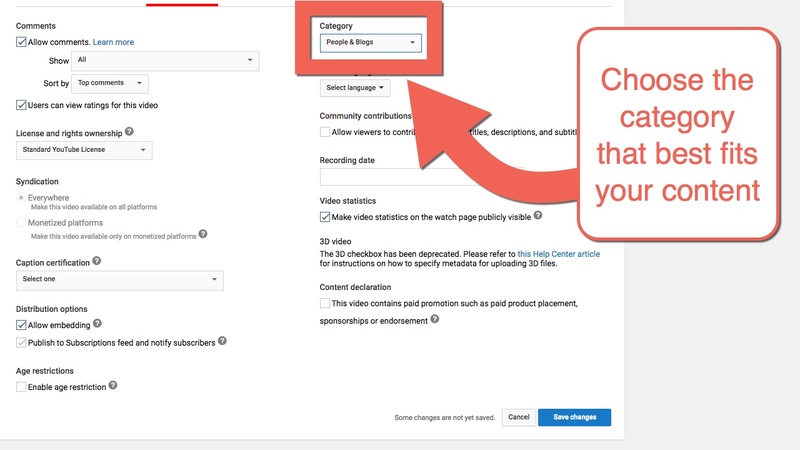 This is a great way to show Youtube that you have specialized content on your channel that viewers can engage with. It also helps to move viewers through your content. When you have videos in a playlist they will play in order unprompted. That means when someone watches a video of yours that’s in a specific playlist, the next will start playing automatically without them having to click on anything else. Playlists are important. Make playlists. Each one of these playlist suggestions can have an unlimited amount of videos in it. 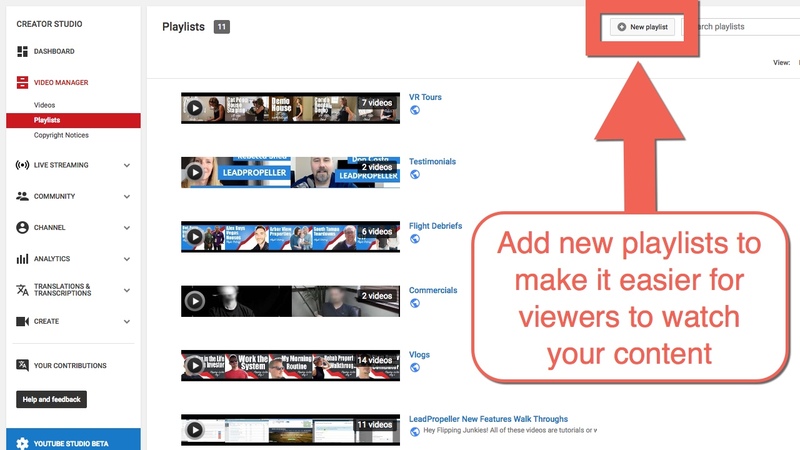 You can even link different, but related, playlists in your end screen annotations to further guide viewers through your content. Make your channel organized and optimized for the best Youtube experience your real estate investing business can have. We know this is one of our longer articles. It’s just because this is such an important topic that everyone can so easily mess up. We didn’t even get to go in-depth in most of the topics. Let us know in the comments if there were any points you want clarified, or if you need more information on anything and we’ll make more articles addressing those concerns! After all, we’re here to help your real estate investing business grow. Speaking of growing your business, we have free webinars every week! It’s free to attend and is packed with expert lead generating strategies for real estate investors. Reserve your seat by clicking the button below!